Meet AVA, a hologram projected onto a human-sized piece of plexiglass. The idea is that AVA, at some time, will respond to questions, offer answers, and provide reliable guidance in multiple languages to travelers who have just landed and need help orienting themselves and understanding local services. Sound familiar? Sounds to me like Avina, the AI virtual intelligence from Mass Effect, who provided you with helpful, anodyne answers to common questions. Her long-winded dialogue tree provided the opportunity to snarf a fistful of potato chips while still, technically, advancing the story of the game. It's the name more than the job description that makes this such a funny coincidence for gamers. AVA currently just gives out a pre-recorded message when approached, but her maker, AirportOne, says she'll develop voice recognition down the line. There are concepts for AVA in different settings, such as a museum, a business or medical information assistant, or a fashion model in a retail location. 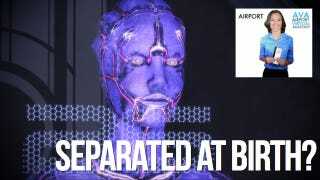 The Turian Asari (whoops) AVA is probably due sometime in the next 150 years.